A complete lesson about Jesus raising Lazarus from the dead is available on The Resource Room. 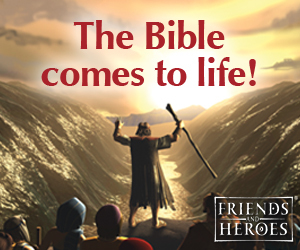 This lesson includes Bible verse cards, printable displays to go along with the lesson, and printable crafts. This paper doll can be used as a prop during your lesson, or you can have your children make them for a craft to reinforce the lesson. 1. Print out the paper doll patterns and loosely cut them out. 2. Glue the patterns together on the white sides so that when you turn the paper doll over you see a different view of Lazarus. 3. 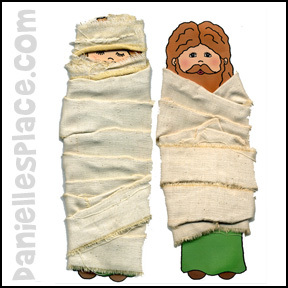 Tape strips of material around the paper doll as you explain that when people died in Bible-times they would cover the body with strips of material. Place the paper doll in a "tomb" (You can use a box or something similar.) and then tell them the rest of the story. 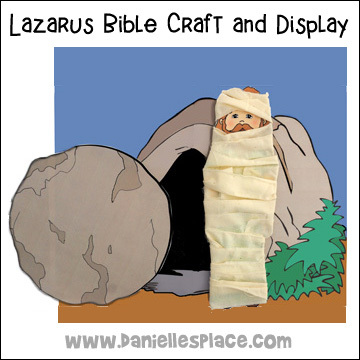 When Jesus tells Lazarus to come out, bring out the paper doll, turn it over so the side with his eyes open is facing toward the class, and unwrap the cloth. 1. 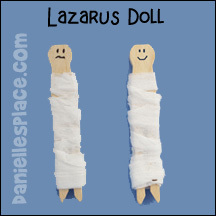 Have your children wrap strips of material or paper towels around the clothespins to make Lazarus. Tell them to draw a sad face on one side and a happy face on the other. They can glue pieces of yarn on the head for hair. 2. Give each child three Styrofoam cups. Have them crinkle up old newspaper to make rocks to fit in the tops of the cups, or you can just turn the cups upside down and place one of the cups over the clothespin doll. 3. 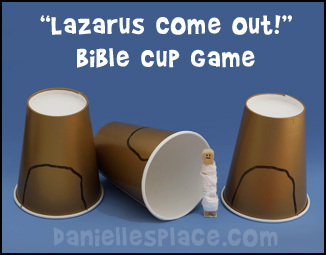 If you don't want to use clothespins and cups to make this game, you can use pictures of Lazarus and glue pictures of the tomb on envelopes. 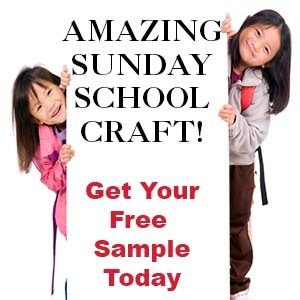 Before class print out patterns and have your children color them and cut them out. Glue the three tomb pictures on three different envelopes. Place the Lazarus paper doll in one of the envelope tombs. 5. Quickly mix up all the cups and then ask a child to point to the cup that he thinks "Lazarus" might be in. He then should say, "Lazarus, come out!" Open up the lid to find out if he picked the right cup. If he didn't pick the correct cup, have him try again. Let all your children have a turn. Tell them to take their games home with them and tell their parents and friends about Lazarus, and play the game with their families. 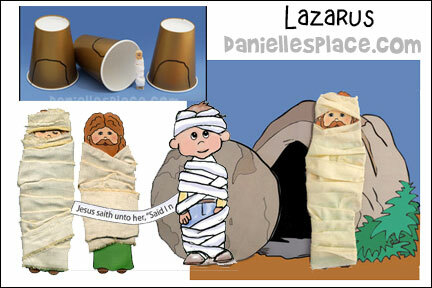 You can also play this game with the "Lazarus" paper dolls and envelopes. 1. Divide your children up into teams of two or three children. 2. Give each team a roll of toilet paper. Have each team pick one child on the team to be Lazarus. 3. 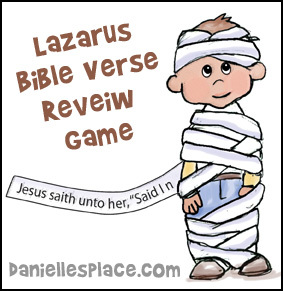 On the word "go" see which team can make the best "Lazarus" in one minute by wrapping the toilet paper around Lazarus. Print the Bible verse on a piece of long material in big letters. Wrap up a child with the material starting with the end of the verse. Hold the material at the beginning of the verse. Have the child turn in circles as you pull gently and back up to reveal the verse. Have your children say the words to the verse as the words are revealed. If you have room on your floor, you can place the material on the floor with the verse showing. Have a children lay down at the end of the verse and hold onto the end of the material and then roll towards the other end of the fabric to wrap himself up. Have someone hold the end of the fabric as the child unrolls revealing the verse. Have your children say the words to the verse as the words are revealed. Divide your children up into two teams. Pick one child from each team to be Lazarus. Wrap up both children with TP. Take turns asking your children questions from the story and previous lessons. 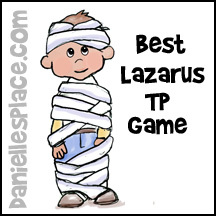 If a child answers correctly, they get to remove ten squares of TP from the "Lazarus" from their team. The team who unwraps their "Lazarus" first wins. Place a line of tape down the middle of your playing area. Designate one side "inside the tomb" and the other side "outside the tomb". Have the children stand anywhere they would like. Tell them that when you say, "Lazarus Come Out", they should all jump to the "outside of the tomb" side of the room. When you say, "Lazarus Go In", they should all jump to the "inside" side of the room. You will try to trick them to jump on the wrong side depending on what you say. If a child jumps to the wrong side, he is out. Keep playing until only one child is left. When you say "Lazarus go in or go out" always jump to the opposite side. The children may automatically follow you to that side even though you said something different.